The program contains a sever bug in line 5-7 that I have seen pretty often. Do you catch it immediately? The output will be something cryptic like ð☼▲x└ or even a crash. 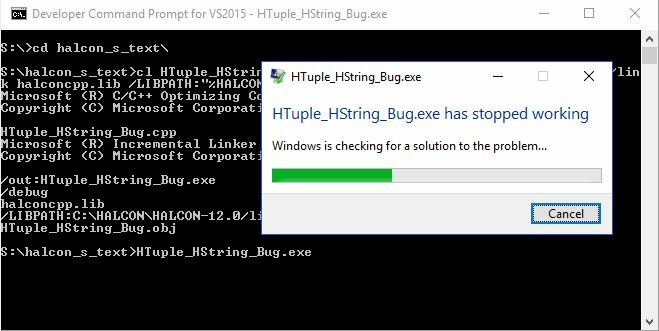 Probably you are not that firm in x86 assembly, but what should be easy to see is the call to HTuple::S, the call to HString::Text on the HString returned by HTuple::S and then the call to the destructor of the temporary HString::~HString. From now on every access to the internal data of HString returned by HString::Text is an access to undefined memory! So the output of s is an output of undefined memory, not of the expected 'Hello World'. btw: Similar to the problem above, one should never assign std::string's c_str() to a const char*.